This morning on Twitter, Warner Bros. confirmed the rumor that a teaser trailer for Fantastic Beasts: The Crimes of Grindelwald will be released on Tuesday, March 13th. We haven’t seen anything in the way of real footage for the film yet, so this is exciting for Harry Potter fans. The film is a direct sequel (although with a big time jump) to David Yates‘s 2016’s Fantastic Beasts and Where to Find Them, which followed wizard naturalist Newt Scamander (Eddie Redmayne) on an adventure in New York city in the 1920s. 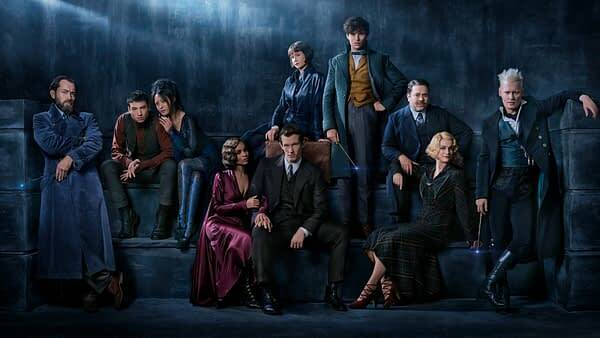 While there, he meets the Goodstein sisters, Queenie (Alison Sudol) and Tina (Katherine Waterston), as well as baker Jacob Kowalski (Dan Fogler). They cross paths with Credence Barebone (Ezra Miller) and Gellert Grindelwald (who was played by both Colin Farrell and Johnny Depp), the evil wizard hellbent on a ‘cleansing’ of the magical word. The Crimes of Grindelwald is a Harry Potter prequel (even though we will get the return of the main cast from Fantastic Beasts); telling the story of a young Albus Dumbledore (Jude Law), the future headmaster of Hogwarts, and his relationship (friendship, but maybe more) with Gellert in their adolescence. We’ll also meet Leta Lestrange (Zoe Kravitz), Newt’s ex, whose photo he carries,. She may or may not be related further down the line to Bellatrix (this hasn’t been officially confirmed by series creator JK Rowling). Fantastic Beasts: The Crimes of Grindelwald is set to open in theaters on November 16th, and we’ll let you know as soon as the teaser trailer drops tomorrow.